This wireless sonar sensor is a great solution to fishing. Its wireless operating range can reach 80 meters and the depth range can be 36 meters underwater. 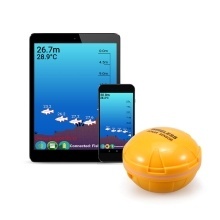 It can connect with your smartphone via BT technology to let you know the underwater situation on your mobile App. Its compact size and light weight makes it quite a convenient tool that fits into your pocket or tackle box wherever you go. Wireless sonar sensor, no more long & heavy cable. 80m wireless operating range, 36m depth capability. 90 degrees beam angle in 125KHz (Wireless). BT connection with your smartphone to view detected data. Depth, temperature, video tape, battery level, and settings. Rechargeable battery lasts for up to 8 hours after fully charged. Small holes for tethering with your fishing line, easy to cast onto water. Compact and lightweight, easy to fit in your palm and pocket.